Innocent Bystanders proposed a series of experimental encounters across Ōtautahi with The Physics Room as a central axis. Blurring the boundaries between contemporary art and dance, performers Julia Harvie, Josie Archer, Kosta Bogoievski, David Huggins & curator Khye Hitchcock set up a framework from which examined dynamics between audience, performer, and site. Local artists were invited to create written responses to the work. Often in contemporary dance or performance production, there is a period of development of a work designed by a capital-C Choreographer, who works with dance practitioners in a private, for-purpose studio. Whilst performance development is often collaborative, this is rarely acknowledged. Once a work is completed, it is transplanted into a performance space where accompanying sound and lighting design is added. Only a select - and usually paying - audience enters these spaces, and they do so with unspoken contracts of witnessing performance and suspended disbelief. Audience behaviour is supported by the style of performance in these spaces; dancers are trained to create movement and interact with the stage environment in ways which conceal its structures - landing softly, moving with lighting cues, using costuming to create illusion. Innocent Bystanders emerged from a shared desire to work together. Julia, Josie, Kosta and David are movement practitioners on equal footing. Each held responsibility and brought their wealth of embodied and critical knowledge to the table. 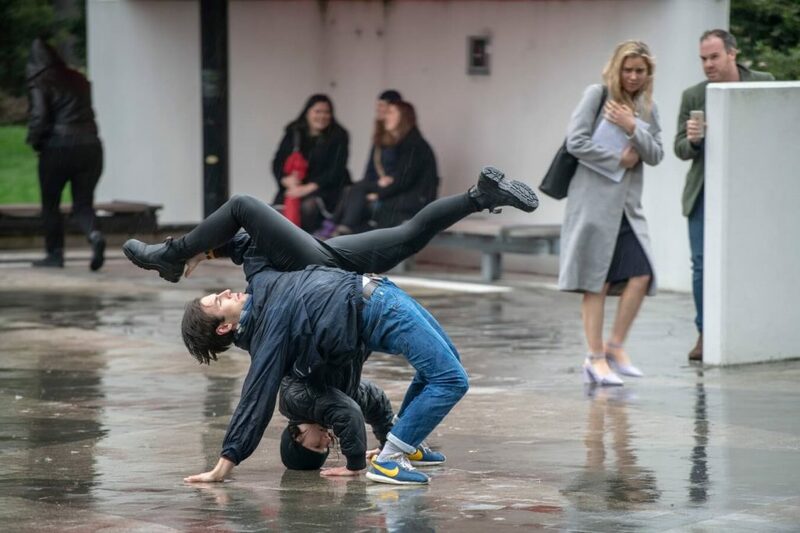 Collectively, we were motivated to discover what might happen if we removed the scaffolding of the usual dance infrastructure; to attempt an undoing of some of the hierarchies in contemporary dance and see how this affected both the practitioners and their audiences. 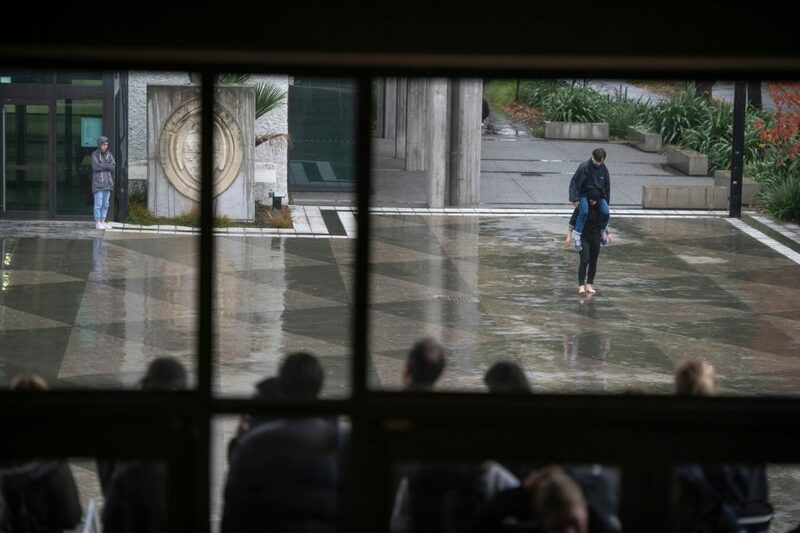 A seven, seven, seven format was chosen deliberately to push the capacity of the practitioners - seven civic sites, seven consecutive days, seven two hour improvised performances. Developing the work using The Physics Room gallery as an open studio residency added another challenge - whilst a gallery space has some similar social contracts to a theatre, audiences often arrive expecting to encounter static art, not people. The week before the offsite events were spent in the gallery developing concepts and strategies: scores to support creating two hour improvisations were designed and tested, methods of communication for gallery visitors and innocent bystanders were deliberated, accessibility and documentation were considered. We were always ‘on site’. All aspects of the work development, including shared conversation and meals, were visible to visiting public and became performative. Performing at different sites was a daily shift of parametres. It created complexity. So we designed structures that would support the artists. We also enlisted help with our navigation of sites. Although Julia and myself are based in Ōtautahi, I have only been here three years; it is a new home for Kosta, and the project marked homecoming for both Josie and David after extended absence. So to expand our perspectives, we invited performance artist Audrey Baldwin, architectural historian Jessica Halliday, and poets Teoti Jardine and Tusiata Avia to join us. We shared food and conversation with them in the week before the performance, and invited them to respond to performances at sites which they could help us navigate. Audrey joined us at the opening performance at The Physics Room. She brought a strength of presence to the space developed through long familiarity with contemporary art and the rhythms of an opening. During her recorded observations, she became part of the performance, sat upon, dragged around, stepped on and over by the participants as they disrupted the space. Amusement was evident as Jessica joined us in the CCC foyer - a location she often frequents in her capacity as Director of Te Pūtahi - Christchurch Centre for Architecture and City-making. In preparation for meeting the site, we referred to a critique of the architecture Jessica penned when it opened in 2010. It provided a way in. The pre-quake intention of the space still hovers. Sharing Victoria Square with Teoti Jardine was a joy. He welcomed us on site with a karakia, acknowledging Papatūānuku and Ranginui, and the traditional significance of the space to Ngāi Tahu, Ngāi Tūāhuriri, and Waitaha before them. We greeted the tī kouka and the fallen leaves. Teoti joined the performance, gently spinning in the centre of one of the circular terraces. Backlit - casting shadows like a sundial. We visited Tusiata Avia at her family home in Aranui a week before the performance on New Brighton Pier. Sitting in her lounge, we spoke of the intention of the project and her relationship with Brighton; a site of familiarity, a particular teenage angst and three generations. She brought her daughter Sepela to the performance. They were both rugged up against the cold sea air. Our opening conversation considered our complicities and lack of knowledge of the histories of the whenua, and the absurdity of the colonial architecture of the pier. These conversations folded back into her poem, drafted within the first hour. Each performer initially agreed to take responsibility for induction at the following sites. Julia introduced us to The Grove of ancient Kahikatea at Pūtaringamotu Riccarton Bush and Josie provided research on the history of South City Libraries, where we also read aloud the user agreement. Then, as with many of the performance structures tested over the week, this one dropped away. For the Bus Interchange and the Square in front of the Puaka James-Hight library at University of Canterbury - it was replaced by coffee and scouting the area before hand. Finding language to communicate embodied knowledge is complicated. 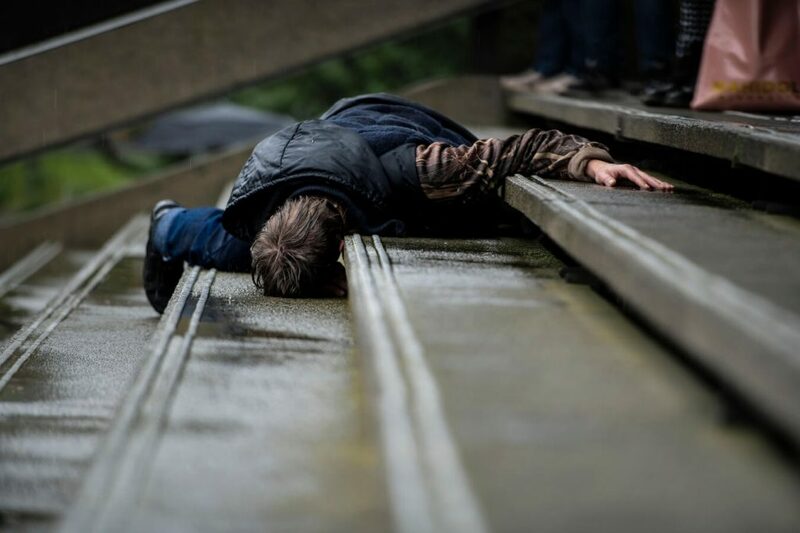 To describe movements of performance is to step away from the lived experience. Something is always lost. When I started writing this, I wanted to describe the performance, but I’ve decided I can’t. The pictures on instagram give snippets, but really, you had to be there. However. There is another, perhaps even less tangible, result of bodies being and moving with intention in public space that I want to acknowledge. The encounter of creative practice in the public realm always holds possibility, however small, to shift experience and understanding. Being at different sites with the practitioners deliberately inhabiting their bodies in ways outside of the ordinary, outside of the constructed norms of the use of each space, outside of a collective comfort zone, you could feel this potential. As a queer person, public space is always something to be navigated. It’s loaded territory. Negotiations of visibility, safety, unspoken social contracts, and transgressions. There’s always at least an undercurrent humming at the back of your mind; sometimes a crescendo poised at the edge of fight flight or freeze. Perhaps this is true for all folk. The intersections of privilege play out in shared public spaces, and how aware we are of them is influenced to greater or lesser degrees by our physical location and social positionings; gender, the colour of your skin, your clothes, your weight, how others perceive you. Ōtautahi is a city with an array of complicated social collisions. We share community resilience, trauma and post disaster fatigue in a broken mending city. Christchurch is historically one of the whitest cities in Aotearoa, and traditional colonial attitudes have held strong here. Yet the quakes have sparked changes in how the city operates: Mana Whenua have formed partnership with the crown, offering tikanga for the rebuild and influencing urban design, and a population of workers from around the world occupies our central city during its reconstruction. Who you see in the city now has changed dramatically in the past ten years. The monolithic monocultural hold of Europeans in the city feels permeable at present. Diversity is a problematic descriptor loaded with power imbalance, however, in a place where representation has been lacking, seeing diverse representation is a shift. On hopeful days, it feels like there is space for growth. That’s not to say we’re there yet. Bigotry and discrimination still exist. The status quo is still skewed towards specific demographics, and this is where projects like Innocent Bystanders offer a potential - they interrupt the usual flow of things. As a visibly queer person, my first experience of New Brighton Pier was on a date with another queer, femme person who had limited mobility. It was early evening mid winter - so already dark. From a queer and femme perspective, we had a very real conversation about if we should go out onto the Pier - it being a dead end and with unknown people on it - and if we did, and encountered trouble, how we would respond, knowing that flight was not an option. Experiencing this site through the project created space for a small shift in my experience. The interruption of dance created unexpected movement and playfulness. Observing the community respond to this unannounced performance in a variety of ways, none of them aggressive, gave me hope that we (collectively, society) are learning to accept difference. This is not to say that art should be responsible for leading this change, nor that artists should put themselves in potentially unsafe circumstances to build these experiences. 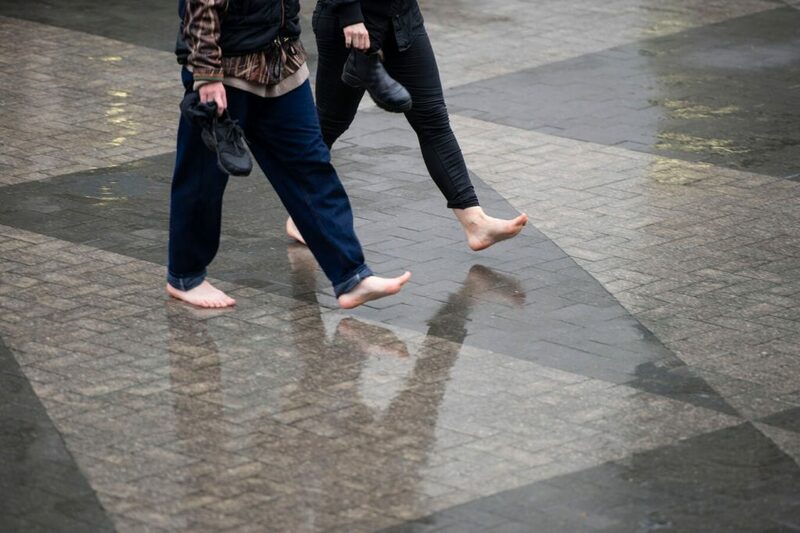 It is more an expression of hope that many small, creative, or unusual, interventions in public space may eventually add up to a cultural shift. These are moments where we practice encountering difference, tolerance, and perhaps even celebration of the different ways we occupy the world. The dance offered a moment of awareness of all our bodies, being and moving in spaces together. This was an aspect of the project I wasn’t expecting, and one for which I’m grateful. The innocent bystander encountering contemporary performance in unexpected parts of their day is unpredictable. Perhaps when we began, I didn’t realise how performative and intermediary my role would be, and at times it was quite vulnerable. Within the first half hour of the first offsite performance, whilst engaging with the security guard and a slightly irate cleaner, it became clear: As the person on site who was obviously with the group, but not disrupting/performing/moving/hiding-in-plain-sight/being a sleepy lion/measuring the width of the site with my body, I became the target for the venting of most audience reactions. These ranged from intrigue and enthusiasm, to concern, outrage, and disgust, and sometimes, all of the above in a single individual. Using civic spaces proved to be a tricky negotiation. Despite our extensive permission seeking, information packs and follow-up calls, there were employees at all the sites who were unaware we were coming. Campus security was called, and attended, despite having sent us a reassuring note that they had put it in their calendar a few days prior. A registrar at the South Library was quite furious that we didn’t have a poster, and was only placated once I mentioned we’d performed at CCC. I got asked almost daily if the performers were drunk or high. 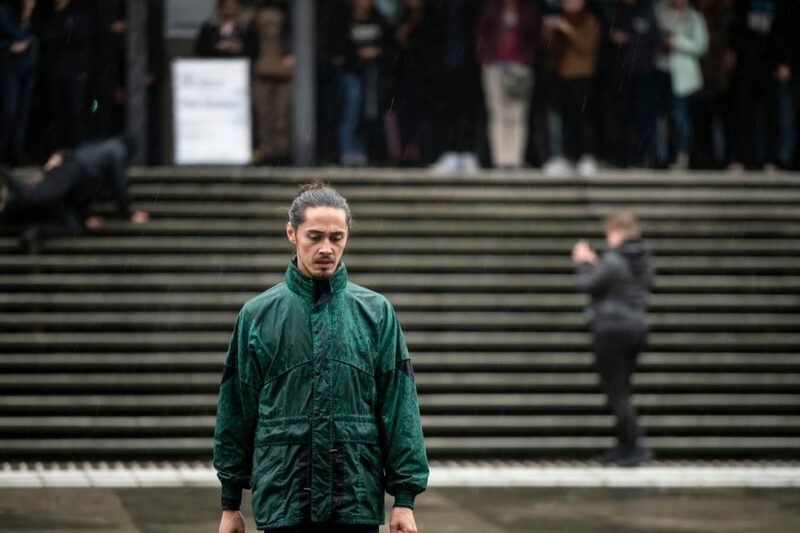 In the lead up we were warned by almost every performance artist we spoke to, that the Ōtautahi public had mastered the art of aggressively ignoring. Indeed, this often proved to be true. One librarian re-stocked shelves for a full ten minutes without once looking at the performers moving in super slow motion less than three feet away. A good number of people managed to not see Julia tossing a chair into the air, repeatedly, in the middle of the bus interchange. Josie basked in a doorway at the city council and people walked around her nonchalantly - as if people regularly sunbathed there between two sets of sliding doors. However, some people enthusiastically saw us. On the pier, all sorts of people actively participated; a mum and toddler did a series of pirouettes as they passed; a group of friends waved their arms around, copying David who was copying Kosta; a construction worker joined in, extra visible in full PPE. A small family paused to watch for fifteen minutes at the entrance to the Kahikatea Grove. At the university, someone who had visited the gallery joined in the performance unannounced - obviously completing tasks from our scores, but without any communication with us. This blurred the boundaries between performer and audience even further. We drew a crowd that packed out the top of the library steps, and extended outward via live stream and snapchat. We were made memes. By the evening, the vice chancellor’s face had been photoshopped onto David’s body. 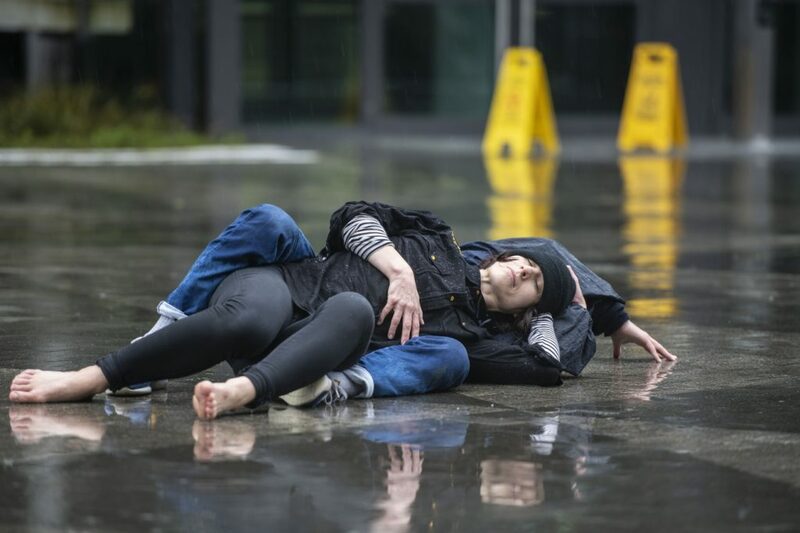 In the bus interchange, in an extremely uncharacteristic Christchurch moment, two members of the public went so far as to join the dancers in their cuddle puddle on the floor. After. After the hot showers and a celebratory drink. After the artist talk and the pack down. After the recovery days melt into weeks and the withdrawals from not seeing each other every day fade. What then? Overall, the process truly underlined the value of being and working together. 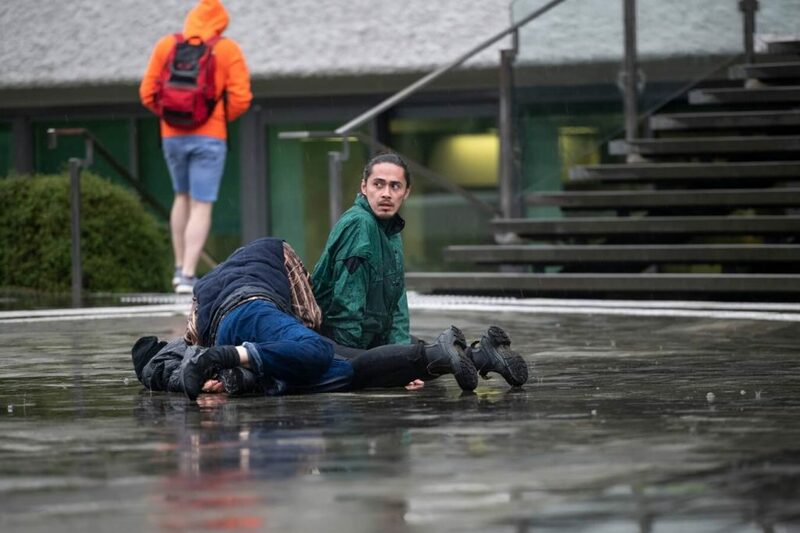 We learnt that innocent bystanders could be surprisingly receptive to unexpected performance if you gave them a way in, and that dancing in the rain will always cause a scene. It seems likely that it’ll take more time to fully process this project. Inviting writers to respond has created new works, as well as documentation. In some ways, we are following arbitrary steps to fulfil funding expectations and track career development. But the most interesting parts always seem intangible, un-writable. This experience mentally stretched us - stretched in that muscle growth kind of way that involves lots of small tears to expand capacity, and constant use to maintain. The durational aspect also pushed right to the edges of our physical capacities. I can safely say seven days straight is not a strategy I personally will employ again (although I cannot speak for Julia!). That said, it must have been good, as further collaborations are already in the works. Our thanks to The Physics Room team and volunteers for looking after us so well; to Tusiata Avia, Audrey Baldwin, Jessica Halliday, Teoti Jardine and Stuart Lloyd-Hall for their contributions to the project; to CNZ and Recycled Boutique for the generous buy in; and to all of our whānau and friends who made it possible.